On a world known as Camelot, SG-1 seeks Merlin's weapon that will destroy ascended beings, believing it to be Earth's best hope to defeat the Ori. Merlin's library in the village is forbidden, however, protected by the curse of its holographic guardian, the Black Knight. 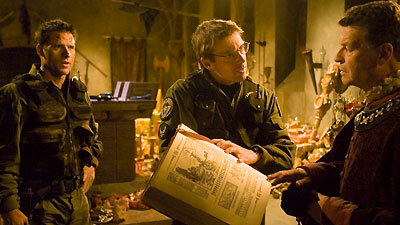 Nevertheless, SG-1 gains access to the sealed archive and discovers an Ancient control console, but when the Black Knight materializes to terrorize the villagers, they demand that SG-1 leave them. Instead, SG-1 is beamed aboard the Odyssey, which is preparing to join the Korolev and an alliance of ships to face the Ori. In a far corner of the galaxy, an Ori supergate has been discovered. Aboard the Odyssey, Carter and Kvasir cooperate to find a means to dial the supergate and deliver Merlin's weapon to the Ori galaxy. Meanwhile, Daniel and Mitchell return to Camelot to search for the device, and Teal'c departs to seek the assistance of the Lucian Alliance. In Camelot, Mitchell is forced to do battle with the Black Knight as Daniel attempts to activate the control console and disable the knight. Suddenly, a vast treasure materializes, but writings suggest that the weapon they seek is not among the riches. The "Sangreal" is Merlin's blood-red pendant, the artifact for which Arthur's knights have quested for generations. Daniel and Mitchell are beamed aboard the Korolev to rendezvous with the alliance of ships near the supergate. Carter and Kvasir have completed their calculations and Carter dons a spacesuit for an EVA to replace the supergate's control crystals. Before she can complete the procedure, however, the enormous gate activates and four massive Ori ships enter the galaxy. Floating in space, Carter can only watch helplessly as the enemy ships easily pierce the defenses of the allied armada. Aboard one of the Ori ships, Vala also watches in horror, witnessing the devastation and knowing that the child of the Ori is about to be born. Arthur defeated Mordred at the Battle of Camlann, after which he and his fellow knights set off to find the Sangreal, or Holy Grail. It is said they journeyed to three distant lands mentioned in Merlin's prophecy: Castiana, Sahal, and Vagon Brei. The Sangreal, also known as the bloodstone for the color of the jewel, refers to the Holy Grail. The notion that the Grail was a cup or chalice, particularly the one used by Christ at the Last Supper, was a late addition to the myth. Earlier accounts describe it variously as a dish, or platter, or in the case of Von Eschenbach and other Middle Eastern influenced chroniclers, as a stone that fell from the heavens. It is the red pendant worn by Merlin, and the key to his secret weapon to defeat the Ori. The second Ori supergate was formed near P3Y-229. The planet itself was destroyed in the formation of the micro-singularity. The Korolev is the newest 304 Daedalus-class ship, given to the Russians, and under the command of Colonel Chekov. I don't know if that's going to help if you keep moving around like Ed Grimley.